Star Wars: The Force Awakens has been in theaters for almost two full months, and Hasbro hasn't even begun to scratch the surface on its action figure line. There are quite a few prominent characters from this sci-fi sequel that haven't been given their own toy yet. But that is about to change in a big way. And one key player in the story is finally getting her own action figure. But there's a catch! Yes, to get the coveted Maz Kanata action figure, you're going to have to shell out a few more bucks. Because she is only available as part of an exclusive play set. The diminutive force-sensitive bar owner comes dressed in her Castle fatigues. The toy is being unveiled as part of New York's annual Toy Fair convention, which is taking place this week, starting Saturday, February 13. Lupita Nyong'o plays the 1,000 year-old mystic, and the release is part of Hasbro's plan to put more female-centric Star Wars toys into stores nationwide. Maz Kanata arrives with her signature blaster in hand. She also comes with her headgear and goggles, included as part of the Takodana Encounter 3-75-inch playset, which also includes three other characters. 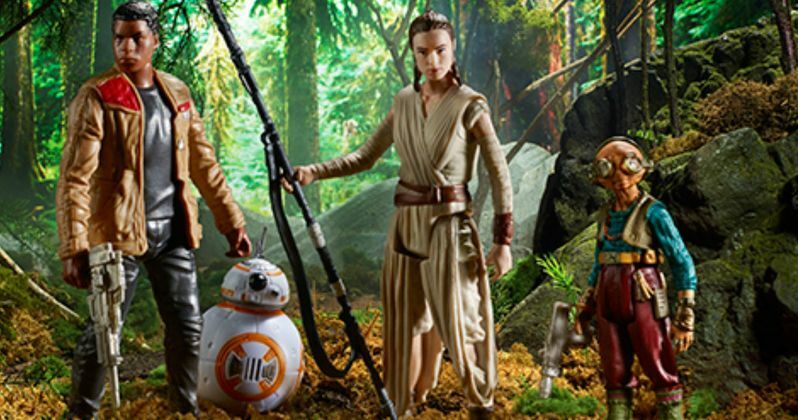 Along with Maz, you will also get Rey in her Jakku desert fatigues. This is basically the same figure that was released as part of the Force Friday action figure line last September. Though, there was a shortage of this particular toy, and it has been in high demand ever since. She arrives alongside her trusty ball droid BB-8. Finn is also included in this playlet, with the AWOL Stormtrooper wearing his signature black Stormtrooper under armor along with Poe's purloined Resistance jacket. The multi-pack will retail for $19.99 and comes with some cool accessories. Fans purchasing the Takodana Encounter set will also get two different blasters to be shared between Rey, Finn and Maz, Rey's signature staff, and two lightsabers. One lightsaber will be fully extended, while the other is just the handle. This is the same blue lightsaber that used to belong to both Anakin and Luke Skywalker, before Maz got her hands on it. The chest that contains the lightsaber handle is included too. There are two more Star Wars toys being unveiled at New York Toy Fair this weekend. The first one is Chewbacca's bowcaster weapon, which Han Solo has a lot of fun with in the movie. This version is a Nerf Super Soaker, and will be on sale in stores and online retail shops this spring. The packaging promises the following about the exciting new toy. "[The bowcaster] helps the Wookiee hero Chewbacca battle the evil First Order, soaking targets from up to 38 feet away." The Bowcaster retails for $19.99 and is recommended for ages 8 and up. But it's not the only new weapon from the movie making its debut this spring. We're also getting a Stormtrooper First Order squirt gun. Retailing at $19.99, it can blast water from 35 feet away. Also coming to a store near you is Hasbro's 12-inch InteracTech Stormtrooper figure. At $29.99, this voice-activated toy is programmed to recite dialogue and make various sound effects in response to the player. It comes with a light-up jet pack and blaster, along with a glowing Imperial insignia. The phrases include, 'A trooper should always stay on his feet.' And it emits a piercing "Wilhelm scream" sound effect when dropped from high places. Take a look at all these cool new items below.